Day 236 – A day of playing in the garden and bubbles. Day 237 – Bank holiday and chucking it down with rain….went and got some paint for the kitchen and ate cake. Day 238 – Started painting the kitchen last night and finished half by 12.30. Then spent today finishing it off and doing a second coat. Looks more purple in the light. Was bored of yellow and fancied a bold colour. Day 239 – Made the most of the final week of the summer holidays and went to Twinlakes. Got myself a slushie and Bee stole it off me even though it was almost as big as her! 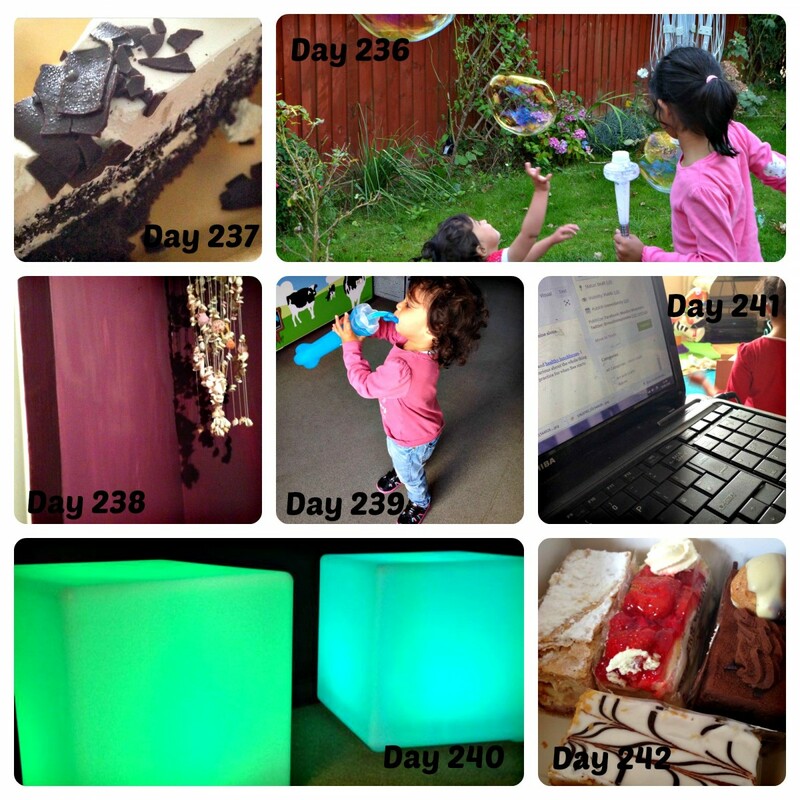 Day 240 – Toddler group today and love these cubes in the dark den which change colour! I want them! Day 241 – Day of rest! Wanted to catch up with some blog posts. Managed one after sitting and staring at the screen for ages. Seem to have lost my blogging mojo. Day 242 – Today I attempted potty training. Didn’t go too well as although she clearly has bladder control she doesn’t seem to want to sit on the toilet or potty. She will but then hold it……so have put it off for now. I needed more cake to get me through the day. Loving all the cake, it’s making me hungry! Those light cubes look very cool. The cakes look delicious. I am craving for them now. Rearing up kids is so tough. -_-” The paint in my kitchen is also purple. It looks good. the potty training will just click one day dont stress over it. Those are rather large bubbles are they not, love how the wee ones get so much pleasure out of popping them. Maybe your mojo will return once the schools go back.